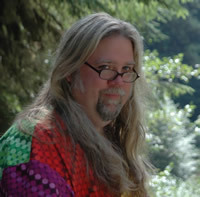 Jay Lake lives in Portland, Oregon, where he works on numerous writing and editing projects. His 2009 novels are Green from Tor Books, Madness of Flowers from Night Shade Books, and Death of a Starship from MonkeyBrain Books. His short fiction appears regularly in literary and genre markets worldwide. Jay is a winner of the John W. Campbell Award for Best New Writer, and a multiple nominee for the Hugo and World Fantasy Awards.